On Saturday, June 8, 2019, hundreds of people will take to the shared pathway in the Southfield City Centre in a symbolic walk to raise awareness and money to combat inflammatory bowel disease, as the Crohn’s & Colitis Foundation embarks upon their second year hosting this event within the City Centre district. And the group will be even stronger this year. On December 4, the Crohn’s & Colitis Foundation announced a merging of the metro Detroit and the Ann Arbor area Take Steps events to form Take Steps Southeast Michigan. Event walkers, fundraisers, family, and friends from both geographic areas will meet in June in the Southfield City Centre for their combined event. “We are excited to be joining with our neighbors to build awareness of inflammatory bowel disease and will make this event the premiere Crohn’s & Colitis walk in southeast Michigan,” says Sarah Arminiak, Take Steps manager with Crohn’s & Colitis Foundation. The Southfield City Centre is a perfect location for the expected crowd of 1,500 participants at June’s expanded event, Arminiak says. This year will mark the event’s eleventh year, and event planners are hoping it will be the best-attended yet. With ample space on extra-wide shared pathways throughout the district that can accommodate walking groups of all speeds, the Southfield City Center offers a nearly tailor-made experience. Along the 2.6-mile route, walkers of every ability will find space to roam, art installations to stop and enjoy, and welcoming benches to rest and take in the scenery. And walkers will have a new exciting experience as they walk through the expanded Red Pole Park, a new interactive art installation along Northwestern Hwy. Just beyond Red Pole Park, walkers will see the new NOAH’s Event Venue—both destinations have been completed since last year’s event. 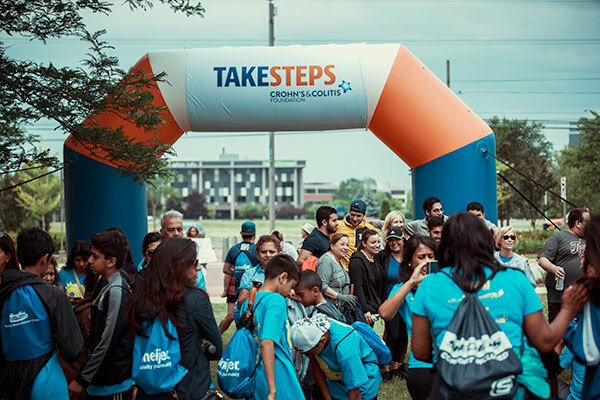 Year after year, participating in the Take Steps Walk may be a very good way to experience the growth and development of the district. In the planning is a pre-walk festival on the Civic Center front lawn. The festival will start at 9:00 a.m. and kick off the event with entertainment and information about inflammatory bowel disease. The walk will begin at 10:30 a.m.
“The front lawn gives us ample space to grow, and there’s plenty of parking, which makes it so convenient for people to attend,” says Arminiak. A partnership experience with the Southfield City Centre made the choice to continue hosting the event in the City Centre district an easy one, says David Paull, president of Medical Weight Loss Clinic, and board president with the Crohn’s & Colitis Foundation Michigan Chapter. “We really appreciate the partnership,” Paull says. With dual objectives of building awareness and raising funds to support programming, walk organizers hope to top the $157,000 raised in 2018, which was up from $130,000 the previous year. Additional business involvement is a goal for this year’s event, and organizers are interested in building collaborations to drive more walk participants to businesses, and to build awareness among employees, visitors, and customers here in the City Centre. Want to build a fundraising team and participate in the walk? Learn how here.